After Valtteri Bottas won at the Australian GP, we have a lot to ponder over as we head to the Bahrain GP on the last day of March! 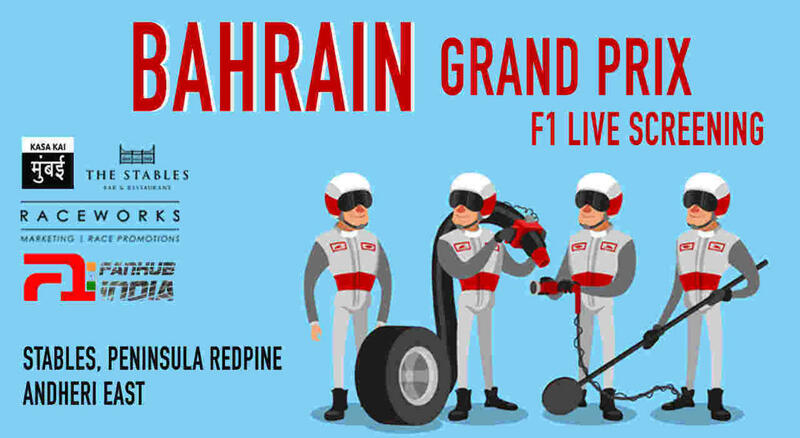 Who will come out on top this time around at the Bahrain International Circuit? Find out as Kasa Kai Mumbai brings to you a live screening of the 2nd grand prix of the Formula 1 season featuring a huge screen, food, drinks, F1 fanatics and all the action that will unfold! See you there! Q: Will the race shown on a huge screen? A: Yes, the race will be projected on a huge screen. Q: Will the commentary be played along with the race? A: Yes, at Kasa Kai Mumbai, we ensure that there is live commentary available for all our race. Q: Will the race be shown in HD (high definition)? A: We try our best to screen our race via HD channels, but this depends on the broadcaster’s schedule as well as the channel availability at the venue. A: There isn’t, but most venues expect you to arrive in a well dressed and respectful manner. T-shirt, jeans and shoes are usually the norm whereas shorts and flip-flops are a disastrous no-no. A: It is recommended that you purchase tickets beforehand so that you aren’t left out if the venue is at full capacity. A ticketholder gets privileges over walk-ins, so a lack of a ticket may spoil plans for your friends and you.